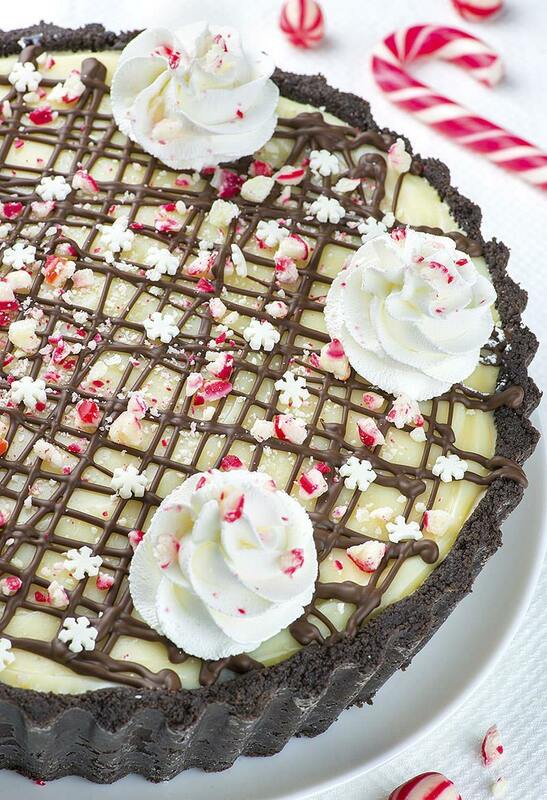 Candy Cane Pie is the only dessert recipe, you’ll need this Christmas! It’s no bake pie with crumbly Oreo crust and white chocolate ganache on top. And the filling is a bomb! It’s combo of cream cheese, whipped cream, instant pudding, butter, chocolate chips and crushed candy canes! However, there are still a few weeks until Thanksgiving and I’ve already shared a lot of Christmas dessert recipes, too. When it comes to Christmas and New Year, I’m always excited like a kid. And I could hardly wait my favorite holidays to come. To tell you the truth, I made this Candy Cane Pie for Halloween. You are probably 100% sure that I’m crazy! But wait, I can explain this! On October 31 was my birthday, not just Halloween! My little boy asked me if we could organize a party at our house. And so we had a party! That was Halloween/birthday party for a few of my closest friends and a bunch of their kids. But a bunch of kids could eat a bunch of sweets, right?! Also, that was a great opportunity for me try out some new recipes I’ve planned to share here on my blog before Christmas baking season starts. And the kids are the best taste testers! They will frankly tell you if something is good or bad. Moreover, they will spit it out to your face whether they love or hate yours cakes, too. However, having a bunch of kids at the party was also a great opportunity to share a lot of cakes and desserts so I won’t stuck with tons of desserts siting in my fridge for days. Therefore I made this Candy Cane Pie besides my birthday cake. And they are both vanished in a blink of an eye! Kids loved them, they all asked for one more slice. 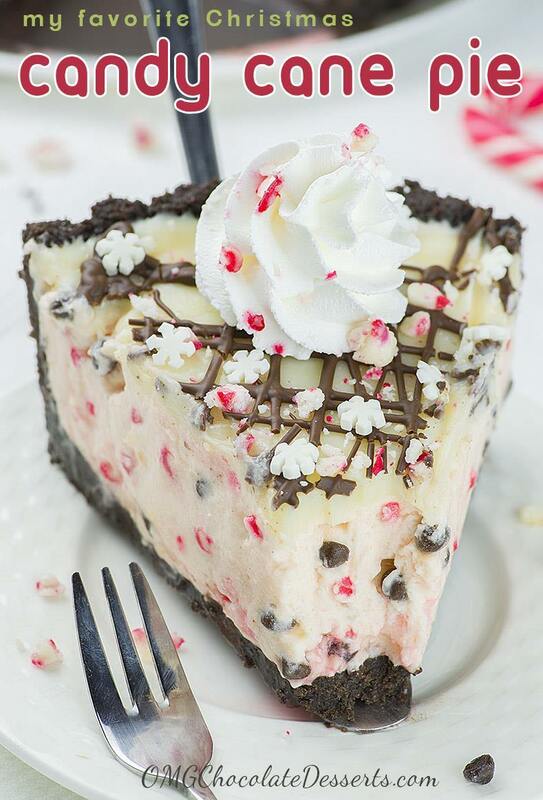 Let’s get back to this Candy Cane Pie. It’s completely homemade! I wasn’t lazy this time so I made everything from scratch. I haven’t used store bought Oreo crust or Cool Whip. I’ve already used Cool Whip in many recipes because it keep thick texture of the fillings, but many of you hates desserts that are having Cool Whip in it. So this time I keep it 100 % homemade, no artificial stuff! In next few weeks many melt in your mouth Christmas recipes follow. I want to make sure you are ready in time for this special holiday season. until new recipes arrives, check some of my old Christmas recipes: Christmas Tree Krispie Treat, Homemade Peppermint Patties, Christmas Lasagna, Reese’s Peanut Butter Christmas Trees or Christmas Cranberry Pound Cake. 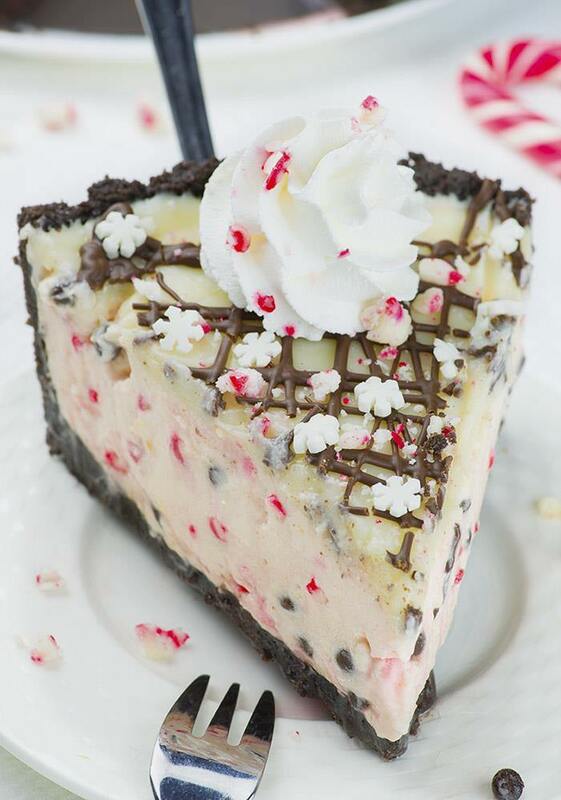 The only dessert recipe, you’ll need this Christmas is this Candy Cane Pie!!! In a food processor ground whole Oreo cookies with the filling into fine crumbs. then, stir in ½ cup melted butter until evenly moistened. Next, press the mixture in the bottom and up the sides of tart pan. Place in the freezer while you make the filling. Mix 1 ½ cups heavy cream until soft peaks form. Add ¼ confectioners’ sugar and vanilla extract and continue mixing until STIFF peaks form. You can use peppermint extract instead of vanilla, it’s up to your taste. Set aside. Beat softened cream cheese and ½ cup softened butter until smooth. Add 1 cup Confectioners’ sugar and beat until well blended and smooth, too. In a small heatproof bowl dissolve 2 teaspoon gelatin in 2 tablespoons cold. Set aside for 5 mins. then, heat over double broiler until the gelatin has melted, set aside to cool. Next, stir white chocolate or vanilla instant pudding with ¾ cup milk until thickens. Now, add the pudding into cream cheese and butter mixture and mix to combine. Then, add 2 cups of beaten heavy cream(reserve leftovers of for garnish), mix on low speed just to combine. Add cooled melted gelatin and mix just to combine. Finally, stir in chocolate chips and crushed candy canes. Now, pour into crust, smooth the top and refrigerate until firm (5-6 hours). In a heatproof bowl place white chocolate chips or finely chopped white chocolate. Next, heat heavy cream until gentle simmer, then pour over white chocolate and let it sit for 1-2 minutes. Now, stir until all chocolate has melted and the ganache is smooth. Then spread on top of firmed filling. Melt 1.5 oz. chocolate,then transfer in a small ziplock bag, cut off the corner and drizzle over the white chocolate layer. Use leftovers of beaten heavy cream to pipe the swirls around the pie. Sprinkle with crushed candy canes and snowflake sprinkles. To assemble Candy Cane Pie you’ll need dish with at least 8 cup volume. I used 9.5 x 2 inch tart pan with removable bottom. If you don’t have one I suggest 9 inch springform pan or deep pie dish. 0 Response to "Candy Cane Pie"